851975 Toa Mahri Dart Shooter is a BIONICLE set released in 2007, based off the Toa Mahri's Cordak blasters. 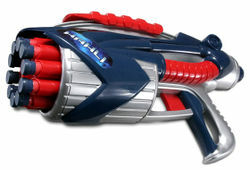 It included a dart gun that could fire ten bullets. Facts about "851975 Toa Mahri Dart Shooter"